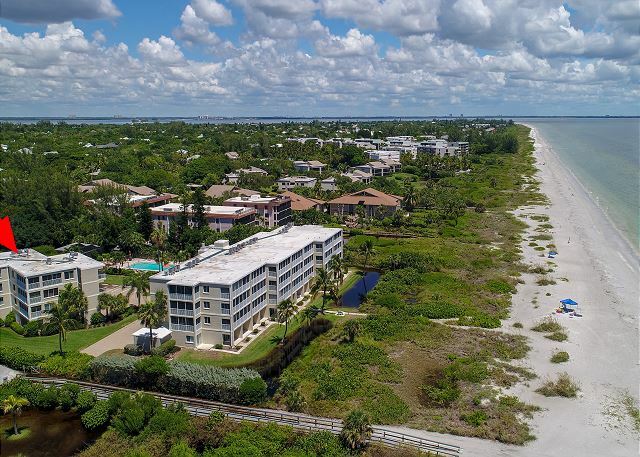 Sanibel Surfside #231: Spectacular 3000 SqFt, 3 Master Beds, Amazing Views! 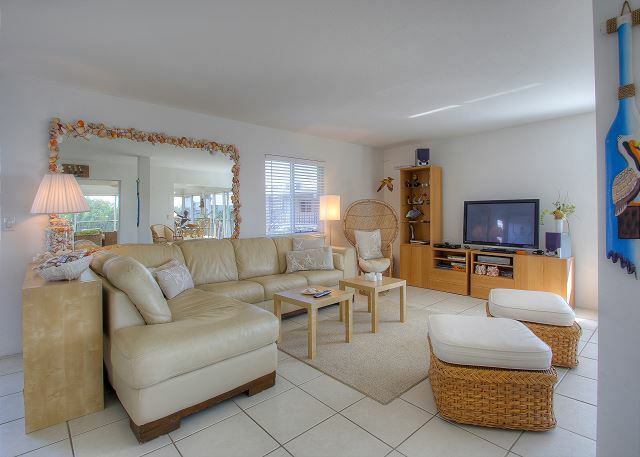 Sanibel Surfside "Sunset" #231 is the most unique and spectacular vacation condominium!! Truly the only one of its kind, this magnificent 3,000 square foot condo has some seriously incredible gulf views!! This condo boasts 3 bedrooms/3.5 bathrooms and all the bedrooms are Master bedroom suites each with their own large private bathroom for added privacy and convenience. The massive living & dining area overlooks the beautiful Gulf of Mexico with expansive views from the top floor and offers an open floor plan just off the huge walk-in kitchen. All mattresses (2K & 2Q) were recently replaced, a brand new refrigerator and dishwasher were just installed, as well as the new flat screen TV's. This unit also comes with a private beachfront cabana that has a toilet, shower and kitchenette as well as storage for all necessary beach supplies (chairs, umbrellas, etc.) Sanibel Surfside is located on one of the world's best shelling beaches and is close to one of Florida's most famous fishing piers at the Sanibel Lighthouse. Condo amenities include: 3 bedrooms/3.5 bathrooms -- 2 King beds, 2 Queen beds (sleeps 6 people max. ), 3 flat screen TVs & a DVD player, CD stereo system, free cable & WIFI, printer/fax/scanner use, shared heated pool, in suite washer & dryer, public BBQ gas grills, shuffleboards, tennis & pickle board courts, elevators, covered parking, private gulf front cabana. No Pets allowed. Bed linens and Bath towels included. Beach chairs, beach towels, and an umbrella are provided for added convenience. 7 night minimum rental period is required. This unit is non-smoking with a STRICT maximum occupancy of 6 people. 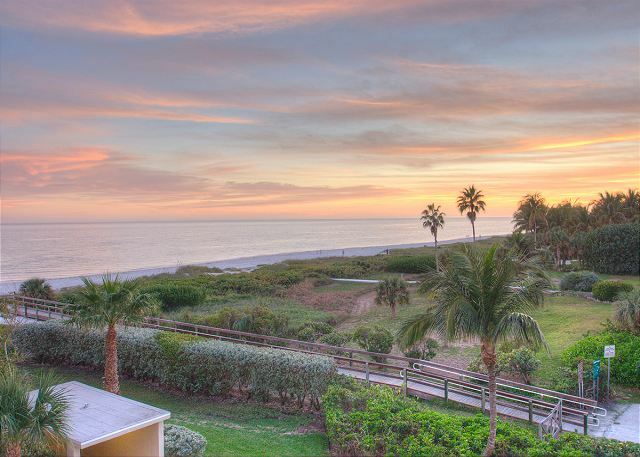 Guest Reviews of sanibel surfside #231: spectacular 3000 sqft, 3 master beds, amazing views! 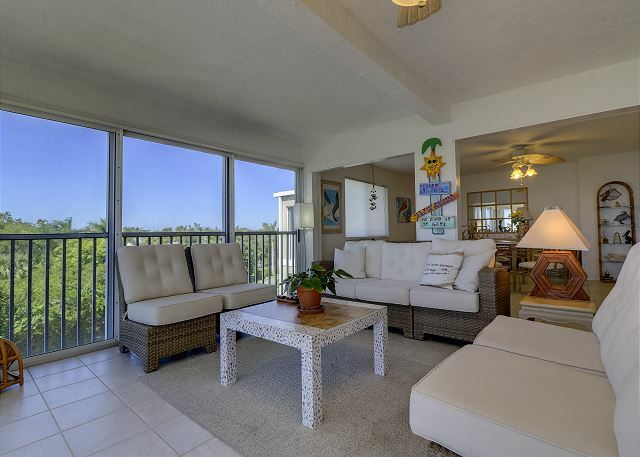 Surfside 221 is a spacious unit with great views and ample sitting and dining areas. While the unit has some new furniture it is also in need of a refresh. Bathrooms were tired needing grouting and painting, two bathroom drains were clogged with hair and dishes needed to be rewashed when we arrived. The kitchen had adquate appliences and cookware, but the glassware was limited, comprised of mostly single glasses that one might find in a college dorm room.THat said, the management company was responsive when towels and cleaning materials were requested. Beds were comfortable and the condition, while not worth the premium price, did not hamper a great two weeks. Thank you for your review of Sanibel Surfside 231. We appreciate your feedback and we are so happy you enjoyed your stay. We are pleased to say that we expect the condo to have updates in the summer. We are always happy to help and we are glad you contacted us so we could try to rectify some of these issues. We hope we can help you plan another trip to Sanibel in the future. Thanks so much for staying with us! Worked well for our family. Nice beach access. Very friendly neighbors. Thank you so much for your review! We are so glad you enjoyed your stay. We hope we can help you plan another trip to Sanibel soon! We had a wonderful week in this condo. Very spacious, met all our needs, and company excellent to work with, very kind staff. Thank you so much for your review of Sanibel Surfside 231! We are so glad you enjoyed your vacation on Sanibel! We hope to see you again in the future! We were a family of six, including teens and grandparents that stayed in the condo for 2 weeks. We only have positive things to say and have recommended the condo to our friends who are interested in staying there next year. The condo was very large with a big kitchen that we used almost every day. We have stayed at rentals that have condiments, spices etc. that are available when you arrive but just as an FYI this one only has S&P. The views are beautiful and the pics are very accurate. Having the beach side cabana with all of the chairs and umbrella was convenient and made it that much easier not having to lug supplies very far. We did need a couple of simple things, such as light bulbs replaced and a cabinet door fixed and they were very helpful and fast to repair them. Everyone we encountered was friendly and professional. For visitors on a budget we recommend stopping at a grocery in Ft. Meyers as the mark up on groceries on the Island is near double the price. We had a wonderful time and my family is already talking about a return trip. Thank you so much for your review! We are so happy to hear that our family enjoyed your stay and that Sanibel Surfside #231 was a good fit for you all! When you are ready to start planning your next trip, let us know! We are happy to help! My family and I have stayed in this condo twice and enjoyed both vacations! 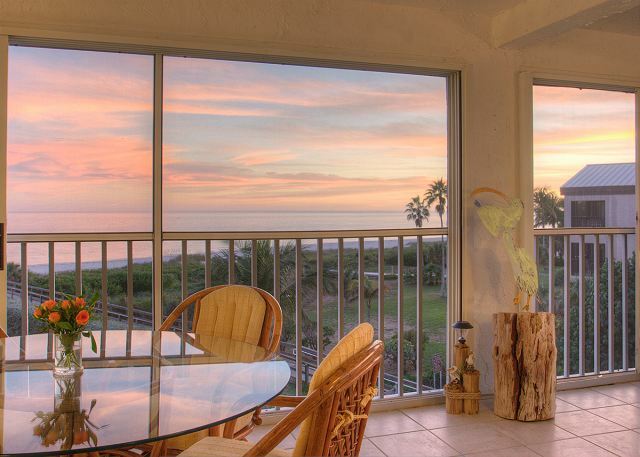 This condo is very spacious and has the most beautiful views of the Gulf of Mexico. Thank you so much for your review! We are so happy you had a great vacation! Please let us know when you are ready to plan your next trip to Sanibel! Very nice experience, SBLvacations were very accommodative and communicative. 5 stars! Thanks so much! It was a pleasure having you - as always! We hope to see you again next year! Gorgeous views. Ample space, with excellent ratio of bedrooms to bathrooms. Well-stocked kitchen with plenty of room for multiple cooks. The extra cabana is very helpful as a waystation to the beach. We had three adults and two children and there was ample space and amenities for every taste. It’s now our favorite place to stay on Sanibel. Thank you so much for your review! We truly appreciate your feedback. We can't wait to see you again! huge, well-equipped condo at a great location. had a slight hiccough with the kitchen sink but the problem was dealt with quickly. Hi Mary, thank you so much for taking the time to review Sanibel Surfside #231! We are so happy you enjoyed your stay and we could help with the problem at the condo. We hope you will stay with us again in the future! Great rental for an extended family. We had three individual couples staying in the unit, with each having their own bedroom! There was plenty of living space that no one felt crowded or in someone's way. The large kitchen allowed us to cook some meals for all of us which was nice not to have to go out all the time. Thank you so much for your review! We are so happy to hear you enjoyed your stay. We hope you will stay with us at SBL Vacations again in the future. Great location. Convenient to the beach. Hosted dinners for a family reunion there and there was lots of seating and space. Nice large kitchen! Would have liked an empty cupboard for groceries! Beach cabana very convenient! Lots of chairs, toys, umbrellas to use. that was a great perk! I would definitely recommend this condo to others!!! Hi Janet, thank you so much for your review! We are so happy to hear that you and your family enjoyed your stay! We hope you will stay with us again in the future! Loved the property & the closeness to the beach. Also enjoyed the fact that a cabana was available for our use. The unit was very clean & well maintained,( had a few light bulbs missing, had a light out over the dining table, a stopper missing in 1 bathroom sink) ,nothing major. Loved the open floor plan & a nice sized kitchen so that several of us could cook together Lots of games available..Had more than enough beach & bath towels. We even enjoyed the pool & the shuffleboard court! Also nice that we had 2 covered parking spots, we did get our exercise hauling things to & from the car! Excellent customer service from beginning to end. We enjoyed the Sunday farmers market , the Darling wildlife park & had a great meal at Cips & some huge fish tacos at Doc Ford's Rum Bar & Grill in Captiva where we did a porpoise watching excursion that was great for our17 mo old grandson. Would certainly recommend this area to anyone! Mr. Viall, thank you so much for your feedback! We are so happy to hear you enjoyed your vacation on Sanibel Island! We also appreciate you taking the time out to leave us the review! We hope next time you come to Sanibel, you will stay with us again! Our condo that we had originally booked was under construction and we were given this condo as a substitute choice. Let me just say, staying at this condo made our vacation even better!!! What an amazing place. 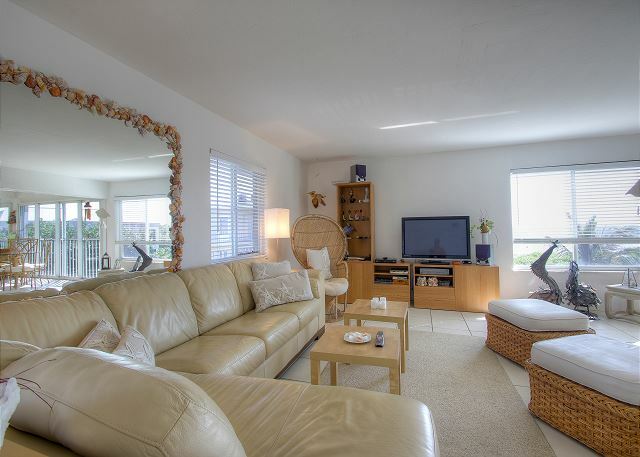 So spacious and accommodating, with a breathtaking view of the beach! When we walked into this condo we were so excited and pleased. It provided plenty of room and amenities. We enjoyed having a family game night with one of the many games provided or doing some of the puzzles while listening to music on the stereo and "fitting in" doing some laundry with the full size washer & dryer. The cabana near the beach equipped with a small fridge, shower, toilet and beach gear was so helpful. This was a great place to store our things without needing to carry it back to the condo. One word sums our experience staying at this condo "Amazing". Thank you so much, we will definitely be back!!! We also want to give a shout out to the friendly grounds keeper gentleman, he was always out early in the morning working hard making the place look GREAT! Thank you! We are so glad that you have such a wonderful time! Such a lovely family it was a pleasure to meet all of you and certainly we look forward in your future vacations with us! Condo was absolutely perfect! Beautifully decorated extra large rooms. View was spectacular, Had one rainy day during our stay, but Pinocchio's ice cream and all of the games that were available in the unit provided several hours of family entertainment. I highly recommend this unit and will definitely add this to our must return list. We are so happy that your family had such a wonderful vacation! We will look for you next year! Our family was here to celebrate our Mom and Dad's 65th wedding Anniversary. The unit was very spacious and well equipped. The view from the living space and two of the bedrooms was beautiful. The unit was very clean and the property was very well maintained. There were ample beach chairs, umbrellas and towels available. We all enjoyed the beach, shelling, and the pool. Surf side is located on a beautiful section of the beach and very convenient to shopping and restaurants. We all had a memorable week at Surfside #231! We are so honoured to have been a part of such a special event! We look forward in seeing your family again. Very nice property. Condo complex is extremely well maintained and very well located. Unit was spacious, clean and had an outstanding view of the gulf. Management company was helpful and friendly. Thank you for the rave review of the condo and we appreciate you choosing to stay with SBL Vacations in this! We hope to see you back on Sanibel soon! Very spacious in a nice area with beach view. Sanibel is a great place to visit- shells, great restaurants, friendly people. Be prepared to buy trash bags, dishwasher detergent if you do much cooking and laundry detergent if you do much laundry. Linens and mattress could use replacements. Sanibel Island is indeed a great place to visit and we hope you enjoyed celebrating your birthday week in Sanibel Surfside #231! I apologize that you felt you did not have adequate supplies provided for your stay but the starter kit items are just to get you up and running to allow you time to make a grocery run in order to buy all the essentials to last the week(s). We've also been busy in recently replacing all the mattresses (2 King & 2 Queen) throughout the condo and we've upgraded linens and comforters as needed due to normal wear and tear that affects them. We sincerely appreciate you taking the time to provide us the feedback necessary to make yours and other future renters stays in the condo the best experiences possible. We look forward to the opportunity of working together again! The property manager was extremely helpful. Everything was in perfect order regarding our check-in and the description of the property was accurate. The property was the perfect location, well-stocked, and the right size for our family. It was nice having the living area separate from the bedrooms. This condo is huge! Thank you so much, Aleece. We are very pleased to hear of your recent time spent in our Sanibel Surfside #231 unit. Thank you for leaving us this lovely review. We look forward to seeing you again soon! We enjoyed our stay here, especially since we got to miss Hurricane Matthew back home. We loved how it felt like a home, plenty of room to spread out & relax. The grills & pool were very nice, too. The shopping carts to help us unload were VERY helpful! Thank you, Sanibel Vacations for a great experience! Thank you so much, Holly! It was our absolute pleasure to have you and your family in our property! We greatly appreciate your kind feedback and look forward to your next trip to Sanibel. The condo was spacious and beautiful. The only minor issue we had was the Wifi kept cutting out but with the closeness of the beach, who needs it. Kevin, Thanks for the heads up on the Wifi issue so that we can be aware of that in the future. Otherwise, we are so glad to hear you enjoyed yourselves and the beach and all the simple beauties that Sanibel has to offer! Come back and see us soon! 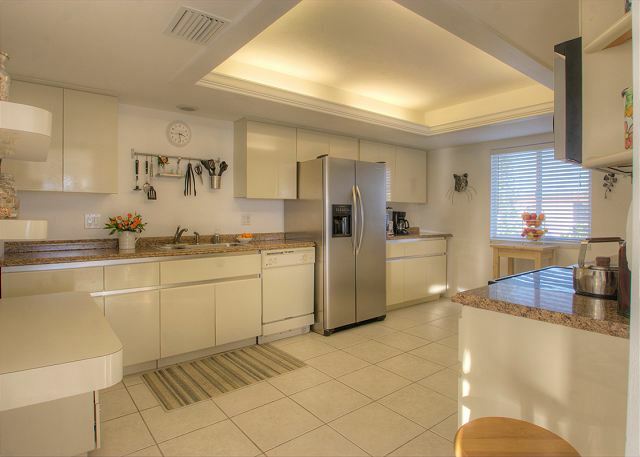 Sanibel Surfside is a very large three bedroom condo with large living area and beautiful views. The unit could use some remodling and the mattresses were not as comfortable. Overall, a nice property. Thank you for your feedback, Lori. We hope that the extra-large condo and great gulf views proved to be an added bonus to your vacation. We've taken your concerns about the mattresses into account and were able to recently replace the 2 queen beds. We look forward to the opportunity of seeing you and your family back again soon! Nice view of the beach and pool. Very spacious. Comfy bedding. Ceiling fans need to be replaced and ice machine in the fridge was not working when we arrived. Bathroom floors need a good cleaning. Too many nic nacs. I would suggest adding a chain lock up high on the doors for families with small children. Jennifer, thank you for your notes and we appreciate the feedback and will take all of it into consideration. As this unit books about 50 weeks a year, that certainly takes a toll on the tile and we apologize that the floors were reflecting that wear and tear. We were able to perform our deep clean and clean the tile and grout in all bathrooms following your remarks. We otherwise hope you had an enjoyable vacation and we look forward to seeing you back soon! Great place. Great amount of room. Great big condo. Very clean and has everything you will need. Pool and beach were terrific. Our family had a great stay. Stayed here and enjoyed the proximity to the beach and grocery store. Very nice to have the storage space on the ground level and it had plenty of beach chairs and umbrellas. Condo was clean. No broom or mop and that would have been handy to sweep the tile floors as sand tends to follow you inside. Would recommend property. Surfside Sunset is exactly as the pictures show. It's a beautiful condo and so spacious. We loved being on the top floor with such a great view of the ocean. We had no problems with anything in the unit. Everything was neat and clean. Plenty of beach towels. Only one hair dryer so we had to pass it around, but wasn't an issue. The property was quiet and the pool was great. We never heard any noise except on Friday which was mowing day and that lasted all day, but it is a beautifully kept property, so that's understandable. The beach is full of such beautiful shells and the island is great. I highly recommend this unit to anyone wanting a large 3 bedroom condo. Four cousins met from all over USA at this wonderful condo. The condo was in a great, quiet location yet we could walk to to restaurants and Tiki Bars along the beach. It was one of the largest condos we have stayed in as the owner bought 2 condos in this complex and made them into one. It is perfect for a large group or family. I would not hesitate to stay here again! This unit is very large. It has a very nice view of the beach. The 3 bedrooms are large and also the 3 bathrooms however the bathrooms could use some maintenance and the beds could use some new mattresses. Kitchen area is large also- fairly well stocked--most items are older. We bought 3 frying pans- their non-stick ones were all scratched up. The toaster did not work. The living and dining areas are very nice. Annual trip to Florida with friends! The is our third year to stay at this rental with friends. We love the size of the unit, the location, the pool and the view. One complaint would be the height of the chairs around the table by the window with the view. They are very low, which makes it awkward to have a meal. They need chairs that are compatible with the table. Also, some of the mattresses need replacing. Two of the bathrooms are definitely in need of updating. But for the most part, we like this condo and plan to come back again. Thank you for your valued feedback. We love to learn how to help better your experience for next year! You'll be happy to know that the 2 king beds have recently been replaced. We apologize that the furniture has since been changed or moved around since the sunset photos were taken of the condo which included a table by the windows. The one table that is in there now does seat the max occupancy of 6 people, although now it's just set back a bit in the dining room area. We look forward to your return next year and for many more to come! An excellent rental experience. SBL has excellent management team and is very responsive. The property itself is spacious, with great views. We have stayed here twice, and my whole family loves it. Thank you so much for taking the time to leave a review for us! We are so happy you enjoyed your trip and can't wait to see you again next year! (3) Husband & Wives aged 50's had a great time at this condo. View was great.Advertised picture is exactly what you see. We grilled and cooked in on two nights. We each had our own bathroom in our bedrooms. Beach had many assorted shells on it which was nice. Local restaurants were very good. We had a very good relaxing week, Thanks! Ms. Busse, Thank you so much for your review of Sanibel Surfside #231. At SBL Vacations, we truly appreciate your loyalty and look forward to having you stay with us again next year! We didn't realize that we were renting in such a quiet time of year. This made it even better.... the beach was not crowded and no lines at restaurants. 🙂 Everything went really well. Great location, huge condo, close to beach and pool. Very large and nice condo! Very clean and very large. Rob and Charlie are awesome! Had a great time! We spent two wonderful weeks in Sanibel and enjoyed the beach and island with a perfectly located condo. The condo was large and roomy with an awesome view of the ocean. Rob took good care of all our needs and questions. One of the best vacations ever! This is our second year in a row to stay in this large beautiful condo. There is plenty of room to entertain with large families or friends or get away when you need some peace and quiet. 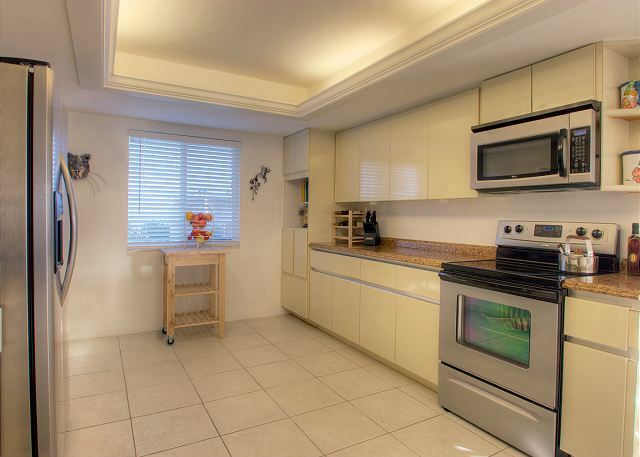 The property and condo is very well maintained. The condo has excellent views from the third floor which is the top floor. Two covered parking spots and a beach side cabana with bathroom made it great for storing bikes and paddle boards which we rented from Rob and was waiting on us when we arrived. The beachside cabana was very handy to store all our beach stuff plus the bathroom was very convenient for the kids. Rob and Charlie do a great job making sure everything is setup for you when you arrive and are easy to contact anytime during your stay if you need anything at all. 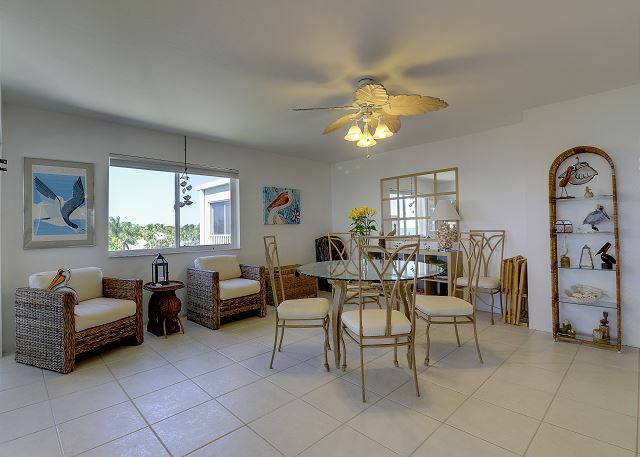 The condo is located on Donax so you are a short bike ride to everything Sanibel has to offer. This condo is hard to rent so if you get the opportunity to enjoy it I would highly recommend it. You wont be disappointed. Rent the bikes and paddle boards. They are a must. Timbers and Doc Fords are great restaurants but you cant beat the conch chowder at the Lazy Flamingo. 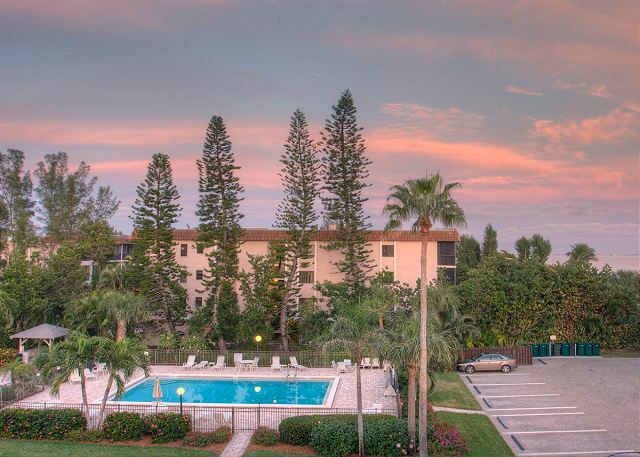 Surfside Sunset is the perfect Condo for three couples or a larger family. All of the condos at the complex are 2 bedroom units with the exception of this unit which is douple in size. The result: tons of space. The three bedrooms each have their own bath and all the bedrooms are large. The living space is huge as is the kitchen.The views are spectacular. The unit was built in the 70's and it does show its age. That said, it was spotless on arrival and the condo is comfotable and has everything you need. The complex is great. Nice pool. The unit has a dedicated covered parking spot. Ron and his team where great. He set up a 4 hour fishing trip which was tons of fun. It was a great week and we would do it all over in a heartbeat. This condo is roomy and the view can't be beat.We watched the sunrise bring the beach to life each morning as we sipped coffee. What a great way to great the morning! The heated pool was a treat even though the air was cool during our stay. What a welcomed surprise and delight it was when our family spent three weeks at this spacious Surfside condo!! 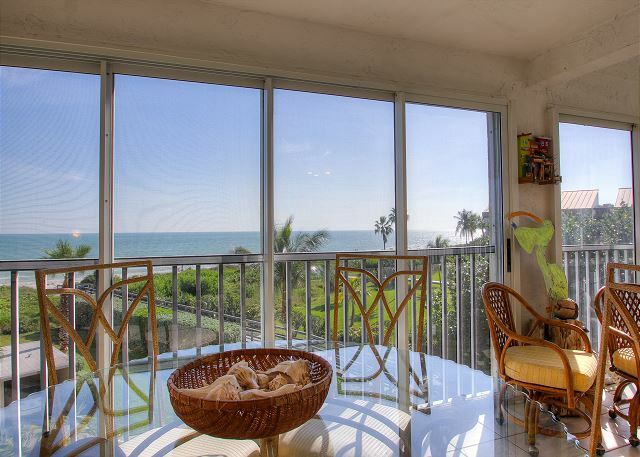 The view of the beach was spectacular from this second floor condo. The short walking distance to the beach became a daily ritual. The facilities included a cabana with sand toys, inflatables, and umbrellas allowing us to enjoy the beach and the pool on site. Surfside is a small complex with well manicured grounds. The large kitchen, the spacious living area, and utility room with washer and dryer made our vacation a home away from home. Rob and Charlie were gracious hosts giving us guidance and assuring us a pleasant and memorable Sanibel experience. They were a wonder source of information regarding fishing, biking, kayaking, and cruise excursions. We look forward to a return visit. Very nice stay the unit came as advertised. Could us a little updating. In the bedroom with the two beds one of the beds was not very comfortable. All in all a great stay. Our vacation was June 14-21, 2014. This is our second summer in this rental. The view is great! The condo clean. Nice, big kitchen. Three den areas, one with TV. Large round dining table, and a separate table perfect for our puzzles. Bedrooms are separated from the living areas, making nighttime much more pleasant for those who want to sleep -vs- those that want to play all night! Full size washer and dryer are a plus, as are the beach towels that are there for your use. The cabana had lots of extra beach chairs, and they're in good condition. The open expanse of windows makes a storm worthy of watching! We had a wonderful stay. The condo is very large, great having a bathroom with each bedroom. I would recommend. We had stayed at Sanibel Surfside before and knew we loved the location. This condo was perfect for our group of 6 adults- it could have accommodated a couple more. We cooked several meals in and the well stocked, spacious kitchen was appreciated. As in most rentals, the knives were not great, you may want to bring your own if you plan on cooking much. Rob was very prompt in returning calls, for check in, he met us at the unit with the keys. We rented bikes from Rob and were pleased with them, we rode them all week long. They were newer than others we have rented from other island companies.I would highly recommend this unit and the property management company. Our family of five, plus a friend, enjoyed our stay at Surfside Sunset! The condo is HUGE with more than enough room for everyone. The kitchen is well-stocked and spacious, the beds are comfortable and the views are gorgeous. The cabana was a nice feature, as well - it was great to have a place to keep all of our beach stuff, as well as a refrigerator and restroom. The Surfside complex is fantastic - beautifully landscaped, well-maintained and as close as you can get to the beach. It's centrally located, as well - it's an easy bike ride to the Lighthouse, Pinocchio's, Schnapper's, Jerry's, Over Easy Cafe, Bailey's and Island Cinema. The Sanibel Vacations team is outstanding! We drove directly to Surfside Sunset where Rob and Charley met us for checkin - it was so nice to skip the hassle of going to a rental office to pick up our key! The bikes we rented from Sanibel Vacations were like new and the guys made sure they were adjusted properly for all of us. We highly recommend Surfside Sunset and Sanibel Vacations - we've already booked again for next year! Marvelous. With 2 other adult couples. Accommodations were ideal. Management was very attentive to our needs. Extremely impressed. 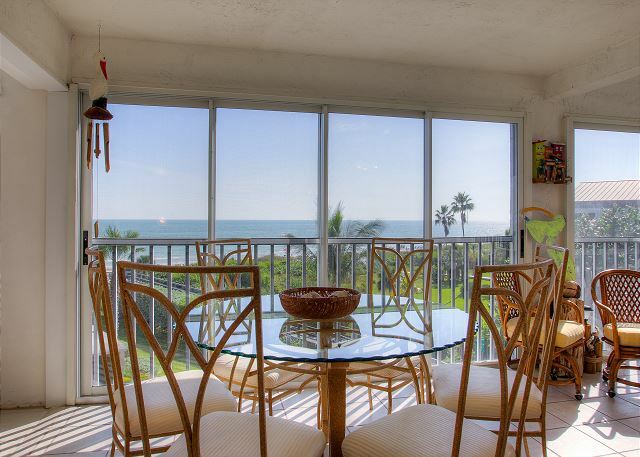 This surfside condo was a great place to have a family get together as well as friends. there are 3 master bedrooms with plenty of room and amenities. The living room area was huge so no one was ever under foot or felt crowded. The view was most spectacular as we could even watch the dolphins travel along the shore. It is all so open and spacious-the pictures do not lie.A great time was had by all and hope to return again in the future. We have rented many homes and condos through VRBO and we give this property a generous "5".The views from the condo are wonderful. What a great week. We will return next year. The location was perfect and the condo was clean, the facility well maintained and the size perfect for four adults and two toddlers.It is in need of updating. There is peeling wallpaper, furniture is old, linens are older.My biggest problem was the number of breakable items in the condo. We traveled with two toddlers and spent the first couple of hours moving all the figurines and other items up beyond their reach. There were over 200 items in the condo. We need for the children to be safe, but we also were concerned about breakage. I am sure the items had a lot of sentimental value for the owner, but we could have done with 80% less than what was there. Our first trip to Sanibel. Can't wait to go back next year. We really enjoyed this condo. The bedrooms were great, so unusual having 3 master bedrooms on the beach. The place was so spacious, nice décor. The view was awesome. We really enjoyed our stay here. Would definitely stay here again. Only thing that would have improved our stay, was if it hadn't rain so much(still made it to the beach everyday), and my mom wouldn't have broke her wrist on the second day. The views, the convenience, the room - what could have been better? Not a thing, as far as we were concerned. Rob and Tim were a delight to work with and handled the entire transaction quite well. We were well pleased and glad to have found this wonderful condo in which to vacation. Very nice property and location in Sanibel. Rob was very helpful! Would recommend this to others!